Settings: MakerWare .3mm/low in two batches (to get the two colors). Technical notes: We used the following settings in the Thingiverse Customizer, which makes a sturdy, compact model that can be difficult to put together but stays together well even when tossed around. 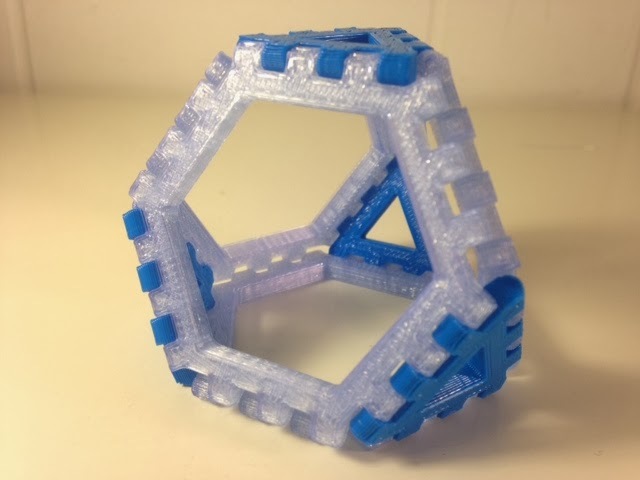 Update: These Poly-Snap triangle tiles were used by owens on Thingiverse to make a beautiful model of a toroidal polyhedron. So cool!